Schley County's Trent Bivins (20) celebrates after scoring a run against Gordon Lee in Game 1 on Thursday. ROME -- Wade Law scooped up the lazy dribbler and flipped the ball to pitcher Chase Patrick who stepped on the bag for the final out. Then a wild celebration erupted. 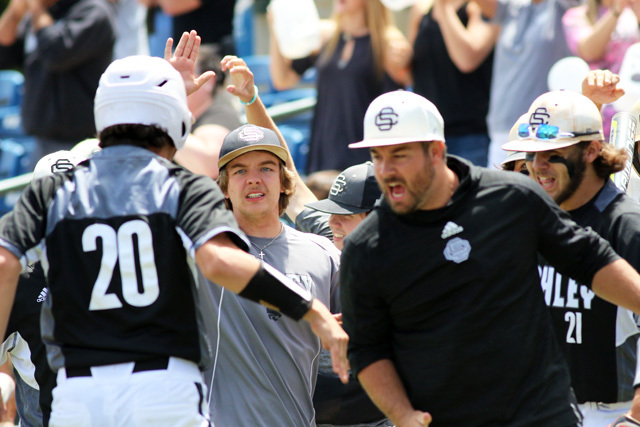 For the second time in three years, Schley County captured the Georgia High School Association Class A Public school state baseball championship at State Mutual Stadium Thursday afternoon. The top-seeded Wildcats used a pitching gem from Will Barry in a 6-0 Game 1 victory, then Schley broke out the offense in Game 2 to win 12-3 and sweep Gordon Lee in the best-of-three series. The seldom-used Barry set the tone in the opener, then ace Chase Patrick hurled a complete-game in Game 2. Schley (34-2) finishes its season on a 26-game winning streak. The Wildcats' last loss was a 13-12 setback against Georgia Independent Schools Association power Deerfield-Windsor on March 9. Schley County dominated a year after many considered the Wildcats to be the overwelming favorite to capture the 2016 Class A Public title. However, the Wildcats were swept in the semifinals by eventual state champion Treutlen. Last year's loss fueled the Wildcats' dominating run this spring. "It definitely drove us because we knew, in our minds, we were the best team (in 2016)," outfielder Reid Ragsdale said. "But the best team didn't win last year in our minds." Gordon Lee ends it season at 27-8. Schley took a 4-0 advantage in the second inning of the second game, then a six-run third inning put the game out of reach. The inning was highlighted by an RBI single from Ragsdale, Cameron Belcher and Clint Sellers, whose single plated a pair of runs. Schley County coach Chuck Cheek said he didn't know championship was sweeter. "They're so different," Cheek said. "The first one, it was special. And this one kind of validates it. There's a bunch of people who have one. Not many have two. It makes it a little bit special."